Patrick Jameson repeated claims about abortion causing breast cancer. 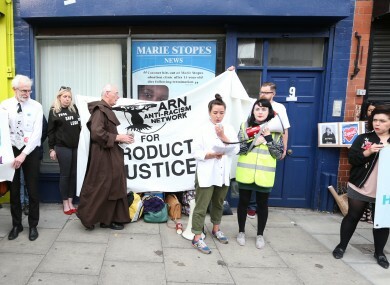 A protest outside the clinic yesterday. THE DIRECTOR OF a crisis pregnancy clinic in Dublin has today repeated controversial claims a staff member made about links between abortion and breast cancer. A recent investigation by The Times (Ireland edition) involved secretly recording a consultation in the clinic between a staff member and a woman seeking advice on a crisis pregnancy. During the consultation, the staff member can be heard telling the woman that terminating a pregnancy increases a woman’s risk of breast cancer and also their risk of suicide. Speaking to Joe Duffy on RTÉ’s Liveline earlier today, director of The Women’s Centre on Berkeley Street, Patrick Jameson, claimed abortion is “the single-most preventative cause of breast cancer”. “Even rats get breast cancer after abortion,” he said, referring to scientific trials. The single most protective thing a woman can do to prevent breast cancer is to have a live baby. When challenged on the issue, he told Duffy: “You can’t handle the truth”. People in Ireland are “being deceived because of the media spin”, he claimed. Jameson also told Duffy a “woman after abortion is one of the most dangerous situations for suicide”. One of the highest groups for suicide is women who’ve had abortions. Consultant obstetrician Peter Boylan also spoke on the show, telling the presenter women should be reassured that they are not at a higher risk of breast cancer after a termination – and there is respected scientific research to support that. The risk of suicide is also not increased by a termination of a pregnancy – that’s another thing that needs to be debunked. “Any arguments in relation to their rejection of abortion should be based on fact and not on scaremongering,” he added. Jameson rejected research referenced by the consultant, instead repeatedly directing listeners to two websites that he said linked to studies supporting his claims. He said women who go for abortions are entitled to be informed about these issues. Meanwhile, another clinic based on Berkeley Street, Reproductive Choices, sought to distance itself from the controversy. In a statement, the health clinic said it wanted to clarify it had no connection with The Women’s Centre, which is located nextdoor. Email “'You can't handle the truth': Director of crisis pregnancy clinic stands by controversial claims”. Feedback on “'You can't handle the truth': Director of crisis pregnancy clinic stands by controversial claims”.